Mey Selections beef and lamb, which is available in a growing number of Sainsbury's stores, was the focus of a special training day, held last week at the Park Lane Marriott Hotel in London, for the company's meat buyers, counter and fresh foods managers. Over 50 Sainsbury's senior counter staff, buyers and food technologists heard Justin James, the company's category manager for meat, say that the supermarket group was fully committed to promoting the brand. "Mey Selections is the best of the best. As a major retailer, it is exclusive to Sainsbury's and we are full square behind it. 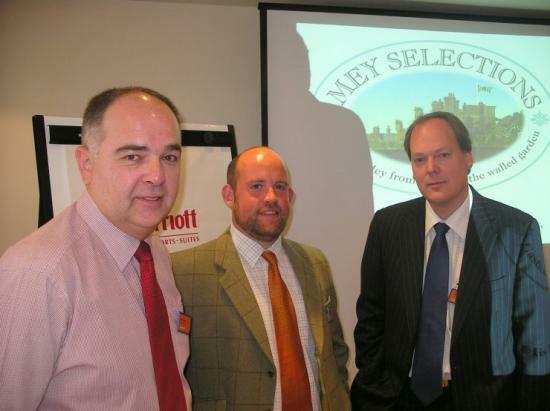 The beef and lamb produced by Mey Selections is all about creating differentiation for Sainsbury's customers," he added. Danny Miller, chairman of North Highlands Products - the company set up to produce and market Mey Selections products - explained the unique qualities of the beef and lamb, all born and reared in the North Highlands region. "All Mey Selections meat is traditionally reared on family farms using predominantly native breeds," he said. "The meat is as good as it gets." "There can be no doubt that the quality of the beef and lamb used for Mey Selections is second to none, and is critical to the brand's performance in the marketplace," he said. "Our maturation and processing methods are designed to ensure the natural quality of the meat is preserved for the consumer to enjoy". Reaction from the audience indicated that public demand was strong, with some customers requesting only Mey Selections meat. Rory Stone, managing director of Highland Fine Cheeses, also gave a short presentation. The Mey Selections Highland Blue cheese, which is made in Tain, is available in selected Sainsbury's stores. In the picture: Garry Cronie (interim business manager, Dungannon Meats), Danny Miller (chairman, North Highland Products) and Justin James (category manager for meat, Sainsbury's) at the training day. A brand new children's food festival will take place in the North Highlands in the summer of 2015 it has been announced. Created and organised by the North Highland Initiative (NHI) in partnership with Scotland Food & Drink, the festival will take place from 5 and 6 June 2015 and aims to highlight the importance of local food production, how to make great cuisine and good food choices and the variety of career opportunities in food production and service. Croft-reared Highland beef and lamb served at the royal wedding reception of Prince William and Kate Middleton is now available nationwide and even across Europe, thanks to a brand new partnership between Mey Selections and Campbells Prime Meat Ltd. Eight Mey Selections cuts of beef are now available for sale direct to the public on Campbells Website and can be delivered fresh across the UK and Europe. After all the months of planning, wondering if the idea would work, and waiting for stallholders to come forward, it was a great boost yesterday to see so many locals and visitors coming in to see us. We already have a waiting list of potential stallholders but we are fully booked for the whole season at the present time. David Whiteford has been appointed as the new Chairman of The Prince's North Highland Initiative. Mr Whiteford will take up the position on 1st June 2009. Organised and hosted by Mey Selections, and with the support of Highlands and Islands Enterprise, a group of ten top London chefs have, over the past few days, experienced for themselves just what it is about the North Highlands that produces award winning food and drink. Philip Corrick, Head Chef of the Royal Automobile Club, commented, "I am certain I speak for the rest of the group when I say that the North Highlands is unique in the UK in being able to deliver time after time, such a variety of quality produce - be it beef, lamb, mutton, seafood, cheese or bakery products, and much more." "The winning combination of the unspoilt environment together with the care and traditional skills employed by the region's fine food producers creates wonderful ingredients and products which consistently deliver on taste and performance. Mey Selections becomes first Scottish consumer goods company to put carbon labels on products Mey Selections, the Caithness based food brand, is the first consumer goods company in Scotland to be certified with the Carbon Trust's Carbon Reduction Label. Mey Selections Luxury Shortbread and two Honey products will carry the Carbon Reduction Label in stores from 1 May, demonstrating the company's work to measure and, crucially, its commitment to reduce its carbon footprint over the next two years. The Kandahar Club races each year in Switzerland at the world famous Murren Inferno downhill ski race - the longest downhill race in the world. This year the North Highland's Mey Selections Barrogill has sponsored the Hulse-Palmer Cup which is awarded to the three Kandahar teams with the best improved times in the Inferno race, and to the member of the Club with the best individual performance. Mey Selections won the Best Retail Initiative award last week at the NEC in Birmingham. The award, given by Radio 4's food and farming programme is seen as the Oscar of the food and farming world and it acknowledges Mey Selections outstanding achievement with customers on a national scale. The Mey Selections brand has now been enhanced by a special range of tweeds designed and manufactured by world leading textiles and cashmere producers, Johnstons of Elgin, and developed in conjunction with HRH The Prince Charles, Duke of Rothesay. Mey Selections Castle of Mey Estate Tweed was launched at the new Johnstons �1.5million Heritage Centre yesterday where it was received by TRH The Duke and Duchess of Rothesay during their visit where they viewed the weaving of the tweed in one of the only traditional mills left in the country. A range of Mey Selections fine food products is now available in Aviemore Highland Shopping, Scotland's latest luxury shopping complex, to be found at the Macdonald Aviemore Highland Resort. Tracy Waters, Business Development Manager for Mey Selections commented: "It is really exciting to be involved with such a visionary retail experience, which has succeeded in gathering together the top quality Scottish brands.